Director Genndy Tartakovsky and writher Robert Smigel are back with a sequel from their successful 2012 film Hotel Transylvania. Events take place shortly after the first movie with the wedding of Mavis (Selena Gomez), the 125 year old vampire daughter of Count Dracula (Adam Sandler) to the human Jonathan, aka Johnnystein (Andy Samberg). The story advances several years later when the couple have a baby, Dennis (Asher Blinkoff) who may be a "late fanger" or may just stay human like his dad. This film is not as adventurous as the first film with it's new take on monsters, but it does carry a nice heartfelt family message. The Count is a proud grandfather to little Dennis who has not shown any vampire leanings. Mavis is concerned that maybe Dennis should be raised around more people like him and not feel left out if he is indeed more human. They decide to visit Johnny's parents Linda (Megan Mullally) and Mike (Nick Offerman). Linda, wanting Mavis to feel more comfortable, over compensates by trying to invite other monster mixed couples from the neighborhood. Johnny really doesn't want to move from the hotel back to Muggleland and it doesn't take the Count much to convince Johnny to make sure that Mavis chooses the hotel. Meanwhile, the Count overly concerned with Dennis not dropping his fangs, takes him to his old summer camp where young vamps learn to be vampires. Of course the camp run by an overly cautious counselor (Dana Carvey) is all sorts of politically correct now and pretty much safer and less scary. The Count's friends, Frank (Kevin James), Murray (Keegan-Michael Key), Wayne (Steve Buscemi), Griffin (David Spade) and Blobbly help him as he attempts to force the fangs from Dennis. 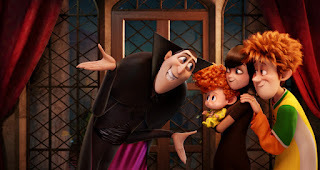 Mel Brooks voices the character of Vlad, Dracula's father who is concerned about his great grandson is not only half human, but the hotel now caters to humans. The 3-D element will bring the box office price up for this film, but it's really not necessary. The comedy while somewhat amusing comes in spurts and stops. Parents may even doze while the kids will be mildly entertained. There isn't a really big message in the story outside of accepting everyone's diversity, be it monster or human. Whether the kids will get that remains to be seen. For a weekend family film, it's short and ultimately forgettable.